For current information, please see the March 2016 CropWatch article "Herbicide Options for Planting Forage Cover Crops Following Corn and Soybean". Cover crop for forage in a field near Lincoln, NE: Knowledge of plant back restriction of herbicides used in corn or soybean is important. Photo courtesy of Amit Jhala. When growers add cover crops, it's important to select and manage the crop according to the primary objective for the crop. Cover crops usually are planted to benefit the soil and are not harvested. Some cover crops may be suitable for grazing or haying though, which means they MUST be selected and managed as forage crops when making herbicide choices. As growers plan to buy seed and herbicides, it is important to know which herbicides should be applied in corn and soybean if they are planning to plant cover crops and use them as forage (also known as "forage double crop"). Most corn and soybean herbicide labels categorize several cover crop species as "other rotational crops," meaning that plant-back restrictions will usually be 18 months or more. Cover crops that are NOT harvested can be planted after any herbicide application in summer crops, but growers assume the risk of crop failure, if the cover crop species is not listed on the herbicide label. However, for growers who use their cover crops as forage or feed, this off-label herbicide activity constitutes breaking the law. An EPA registered herbicide label is a legal document and the instructions must be followed to avoid violating federal law. It can be difficult to find information on which herbicide(s) to use or avoid for certain cover crops, especially when planning to use the cover crop for forage or feed (forage double crop). Due to the crop rotation interval specified on the label, the herbicides listed below can be applied in corn or soybean and forage double crops can be planted in the fall after corn or soybean harvest. Note that only the listed forage double crop can be planted and used for forage. When tank-mixing with other herbicide(s), refer to all relevant labels for rotational/re-cropping instructions, following the most restrictive intervals. AUTHORITY ASSIST: Cereal rye and wheat can be planted 4 months after Authority Assist is applied preemergence in soybean. This interval is 18 months for Minnesota and North Dakota, north of Highway 210. Do NOT feed treated soybean forage or hay to livestock. DUAL II MAGNUM: If not more than 1.33 pint/acre of Dual II Magnum is applied to the soybean field, carrot, radish, and turnip can be planted 60 days after the last application. Alfalfa can be planted 4 months after application. A second application of Dual II Magnum or other herbicides containing Dual II Magnum (S-metolachlor) is prohibited when planting the above-mentioned forage double crop in fall. SHARPEN: Sharpen can be applied preemergence in soybean at 1 fl oz/acre if the organic matter content of the soil is more than 2%. This herbicide will provide limited broadleaf weed control at this rate. Coarse soils with less than 2% organic matter require a minimum preplant interval of 30 days for planting soybean. Several forage double crops, including barley, cereal rye, oats, pearl millet, sorghum, and triticale can be planted after soybean harvest without restriction. Field peas and chickpea can be planted 60 days after applying Sharpen. OUTLOOK: Barley, cereal rye, oats, and wheat can be planted 4 months after an application of Outlook preemergence in soybean. PURSUIT: Cowpea and field pea can be planted any time after applying Pursuit in soybean, but alfalfa, cereal rye, clover, and wheat must be planted at least 4 months after an application of Pursuit. This will restrict the postemergence application of Pursuit in soybean if growers intend to plant alfalfa, cereal rye, clover, or wheat in fall. VALOR SX or VALOR XLT: Barley, cereal rye, and wheat can be planted 4 months after preemergence application of Valor or Valor XLT in soybean. CADET: Following harvest of soybean treated with Cadet, any crop may be planted. CLASSIC: Annual ryegrass, barley, cereal rye, oats, and wheat can be planted 3 months after an application of Classic in soybean. Therefore, Classic should be applied early-POST to meet the 3-month interval for planting listed for forage double crops in fall. FUSILADE DX: Barley, cereal rye, pearl millet, sorghum, triticale, and wheat can be planted two months after an application of Fusilade DX. GLYPHOSATE: Following harvest of soybean treated with glyphosate, any crop may be planted. HARMONY SG: Barley, oats, triticale, and wheat can be planted any time after an application of Harmony in soybean. Annual ryegrass, cereal rye, pearl millet, sorghum, radish, alfalfa, clover, cowpea, field pea, and vetch can be planted 1.5 months after applying Harmony in soybean. POAST PLUS: Alfalfa and clover can be planted any time after an application of Poast Plus, but a 1-month interval is required for planting annual ryegrass, barley, cereal rye, oats, pearl millet, triticale, sorghum, radish, cowpea, field pea, and vetch. RESOURCE: Any crop can be planted one month after an application of Resource in soybean. SELECT MAX: Select Max is an herbicide for grass weed control, including volunteer corn in soybean. Alfalfa, brassicas (including radish and turnips), clover, cowpea, and field pea can be planted any time after an application of Select Max, but a 1-month interval is required for planting any other forage double crop. ULTRA BLAZER: Barley, cereal rye, oats, pearl millet, triticale, and wheat can be planted 40 days after applying Ultra Blazer in soybean. The application rate of Ultra Blazer should not be more than 1.5 pint/acre. Soybean cannot be used for livestock grazing or feeding after an application of Ultra Blazer. CALLISTO: Callisto can be applied preemergence in corn. Oats, pearl millet, and sorghum can be planted any time after application of Callisto, while barley, cereal rye, triticale, and wheat require a 4-month interval after application. DUAL II MAGNUM: If not more than 1.33 pint/acre of Dual II Magnum is applied preemergence in corn, carrot, radish, and turnip can be planted 2 months after application. Alfalfa can be planted 4 months after application. A second application of Dual II Magnum or other herbicides containing Dual II Magnum (S-metolachlor) is prohibited when planting above mentioned forage double crops in fall. OUTLOOK: Barley, cereal rye, oats, and wheat can be planted 4 months after an application of Outlook. SHARPEN: Sharpen can be applied preemergence in corn at 2 to 3 fl oz/acre depending on organic matter content of the soil. 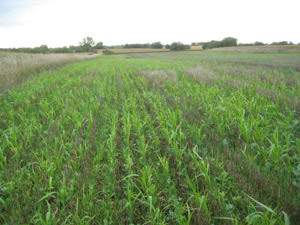 Several forage crops, including barley, cereal rye, oats, pearl millet, sorghum, triticale, and wheat can be planted after corn harvest without restriction. Field peas and chickpea can be planted 2 months after applying Sharpen. VERDICT: Barley, cereal rye, oats, and wheat can be planted 4 months after preemergence application of Verdict in corn. BUCTRIL: Alfalfa, annual ryegrass, barley, cereal rye, clover, cowpea, field pea, oats, pearl millet, radish, sorghum, triticale, vetch, and wheat can be planted 1 month after an application of Buctril. CADET: Following harvest of corn treated with Cadet, any forage double crop may be planted. GLYPHOSATE: Following harvest of corn treated with glyphosate, any crop may be planted. HARMONY SG: Barley, oats, triticale, and wheat can be planted any time after an application of Harmony in corn. Any other forage double crop can be planted 1.5 months after applying Harmony in corn. IMPACT: Barley, cereal rye, oats, and wheat can be planted 3 months after applying Impact in corn. LIBERTY 280 SL: Barley, brassicas (including radish and turnips) cereal rye, oats, radish, triticale, and wheat can be planted 2.3 months after an application of Liberty 280 SL in corn. RESOURCE: Any crop can be planted one month after an application of Resource in corn. STINGER: Annual ryegrass, barley, oats, radish, and wheat can be planted any time after an application of Stinger in corn. YUKON: Annual ryegrass, barley, cereal rye, oats, proso millet, sorghum, triticale, and wheat can be planted 2 months after an application of Yukon in corn. If a forage double crop is not specifically listed here, it cannot be planted legally in the fall following harvest of corn or soybean. Herbicide information compiled here is intended to be as accurate as possible at time of publication; however, refer to herbicide labels for the latest and more detailed restriction information. For more information on cover crop termination methods and crop insurance, see the 2015 Cover Crops FAQs (Frequently Asked Questions) page on the USDA Risk Management Agency (RMA) website.